A friendly guide to group practice. Diana Shiflett has been leading groups of all descriptions in spiritual practices for many years, and she understands the difficulties involved: the potential for awkwardness and self-doubt, or the nagging question of whether anyone's getting anything out of this at all. But more than that, she understands the value of spiritual practices: their deep roots in the history and worship of God's people, ad their ability to calm our distracted minds and hears so we are ready to hear the voice of Jesus. In this personal, hands-on guide, Shiflett walks us through a wide array of spiritual practices, from communal silence and Scripture meditation to active prayer and corporate discernment. She proves a reliable guide, offering step-by-step instructions, pointing out hazards and pitfalls, and sharing her own experiences with honesty and humor. With this book as a guide, these spiritual practices can become life-giving resources in your ministry setting for years to come. As an introvert, I'm constantly amazed at how doing spiritual practices in community is so transforming and so rarely offered. - Jan Johnson, author of Meeting God in Scripture AND Abundant Simplicity. Christian growth is not a solo occupation. It is a partnership between the body of Christ (that's you & me) and the Spirit of Christ. The strength of that partnership develops with practice. And this practice, like other practices, can be a team effort. 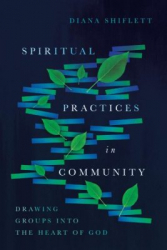 Shiflett highlights how disciplines practiced in community with conversation, questioning, listening, and reflection shape our relationship to God, self, and others. Shiflett is a trustworthy and practical guide. Working from hands-on experience she provides step by step ways to practice spiritual transformation with others. - Adele Calhoun, co-pastor of spiritual formation, Highrock, Arlington.